I understand that the only real uses of -ite blocks are for decoration or to craft other -ite blocks. But I think that -ite blocks are used significantly enough for decoration. I am an admin on a server, and almost every building we have contains -ite blocks. Maybe we should make it so that you can use -ite blocks as a substitute for stone in crafting redstone repeaters and comparators, like you can do in the Bedrock Edition. I don't think the -ite stones should be removed, I think they should be fixed. As you can see, these would be much more pleasing to build with. In addition, there should be slabs (though stairs might not be necessary) for the polished versions, and stone tools should be craftable from Diorite, Granite and Andesite and any other similar stones. This alone would be enough that the stones would be a hundred times better. I agree they should be fixed, and actually REMOVING a block is not a good idea because it will cause issues with worlds created WITH the block i.e. any 1.8+ world. My hope is that the current texture update that JAPPA will fix the eye-sore aspect of those stones, and the changes to 1.13 will make more blocks possible. I also like Grian's suggestion of having "special" stones appear in particular biomes. If you want Limestone, as an example, you will have to go to the biome where this is found. Part of the grief with the *-ite blocks is that you have no slabs are stairs. I would suggest stairs are necessary as well as slabs for roof building. I build my roofs out of "some kind of stone", usually nether brick or sandstone so they can't catch fire. If I need a less sloping roof, I mix half-slab so mobs simply can't spawn on the roof. *-ite blocks with slabs and stairs would in turn mean more options for non-flamable roofing material. I like how they look, although I would like more variety like Stone Brick style variants or 2x2 tile versions. I also think part of the problem with them looking bad underground is just bad world generation, they seem to generate in weird blobs rather than large seams. I'd prefer biome rarity generation rather than large seams, or larger seams IN specific biomes, but yes... a big part of the problem is uniform blob generation everywhere. I totally agree with Romaq / Grians suggestions. The world generation of these stone variants should also be changed so that they spawn in large, uncommon clusters, instead of the small and awkward-looking "veins" that we have currently. It would look something like in these screenshots (from a mod that also adds a few other stone types). This isn't a good reason to remove it from everyone's game. Just as an idea, what if there were 16 stones that fit into the Minecraft color pallete? Redstone and Lapis would not spawn in different biomes, they will still spawn like ores. You may notice that Marble isn't here. 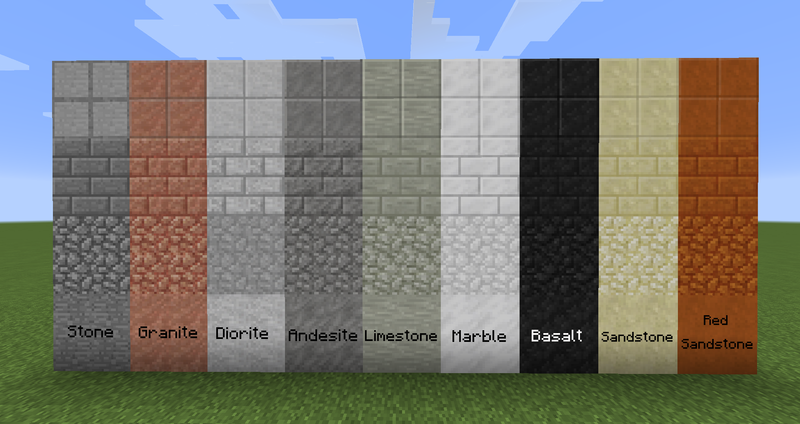 I feel like Diorite is supposed to be Marble, and I don't think we need too many different shades of white. Alternatively, we can rename Diorite to Marble, because it's likely that more people have heard of Marble than Diorite. There are a lot of slots to be filled, but having a stone variant for each of those would make for a very nice set of building blocks with stairs, slabs, bricks, tiles and cobbles to match. It may also be useful to add in Gravels and Sands for each stone variant, although this isn't completely necessary. Of course, because of the vibrant colors and crafting uses of Redstone and Lapis, they will still remain rare in survival, but readily available to creative-mode players. EDIT: Added in some suggestions for names, fixed some odd sentences. The idea of having 16 variants might work, but my hope is for consistent behavior across types. Stone is a "type". All "stone" should behave such that they all have stairs and slabs, they all have "cobble", and so on. But at this point, I think we'll be lucky if we got anywhere near slabs and stairs just for the *-ite variants. There is a whole fuss on this topic on redit. I can't find the link, but Grum appears against adding anything to do with the *-ite blocks. "Limitations inspire creativity!" Yeah. Ok, but without color and stylistically matching *-ite blocks with everything else, they are an eyesore as the OP suggested, and without the stairs and slab shapes, functionally limiting. This makes those too "ugly" in the default texture for most people to want to use them, and too functionally limiting to use. Perhaps Mojang needs to be more creative with their limitations. "and i think caves would be less confusing and way cleaner if they were removed"
...Seeing a rock that's not the same as the other rocks in the cave is confusing? But seriously, maybe they'll be fixed in 1.14? But at this point, I think we'll be lucky if we got anywhere near slabs and stairs just for the *-ite variants. There is a whole fuss on this topic on redit. I can't find the link, but Grum appears against adding anything to do with the *-ite blocks. "Limitations inspire creativity!" That's a terrible argument not to change a texture or add in useful blocks, especially when they just added in monochrome concrete blocks to make color schemes much easier. That's like making an Office Document editor where the only font is hot-pink Comic Sans and then telling me to write a serious looking document, but then adding in multiple ways to make bullet points in lists. I agree it isn't a compelling argument against slabs and stairs. I think a compelling argument in favor is "I need more variety in stairs and slabs that are not flammable!" I'd "like" *-ite blocks to have non-spawnable stairs and slabs, but I could get by well enough if *-ite blocks looked good against concrete colors *AND* concrete supplied stairs and slabs as non-spawnable roofing options. Red sandstone, sandstone, cobble, stone brick, stone slabs (but not matching stairs), nether brick, brick, quartz, and pur-pur. I think that completes the non-flammable roofing options. On one of my early servers, I built a barn with a wooden roof and had it look nice. Unfortunately, there was a bug in that version that didn't put out fires in the rain, and my barn burnt down repeatedly from lightning strikes. Since that time, I swore off any roof out of flammable material. "Limitations inspire creativity" doesn't wash against lightning repeatedly burning down my stuff. I really think stairs and slabs would go a long way to soothing the *-ite hate. These blocks were added purely for aesthetic, to add more variation to the world. Right now they're fine by me, but I like Cl1ff's suggestion to make them look smoother when polished, and the ability to make slabs and stairs out of them.